One of the most dreaded words in the English language. Partly because we hate to pay them and partly because we don’t understand them. Luckily, I just completed my 2015 taxes last week and I’ve got a couple of tax credits that you need to know about. If you, your spouse, or your kid was enrolled in college last year, you need to pay attention to what I’m about to discuss. There are 2 education tax credits that you must know about. The American Opportunity credit and the Lifetime Learning credit are out there to help off-set the large expense of higher education. The IRS puts out a publication 970 every year that details the new rules and regulations of how these tax credits work. Now these are tax credits, not tax write-offs. It’s a big difference. A tax credit gets applied DIRECTLY to the taxes you owe, whereas a tax write-off just decreases your income subject to income tax. This means that after all of your taxes have been accounted for, this credit comes off the final bottom line. Let’s say that normally you would owe the government $1,000. Now, if you get a $2,000 Lifetime Learning credit, you’ll get a refund of $1,000! Becuase it gets applied directly to your tax bill. So $1,000 – $2,000 = refund of $1,000! My wife was in school last year so we got to claim this Lifetime Learning credit. And although the school bills are super expensive, at least there is a small tax credit out there that helps ease the pain a little. You cannot take both the American Opportunity credit and the Lifetime Learning credit, but you should be able to take at least one. So let’s dig into each and see what kind of money we can save you on your taxes! This tax credit is for the first four years of college. It allows students, or their parents, to receive a tax credit up to $2,500 fo the first four years of school. Like all credits it depends on your earned income, amount of qualified expenses paid, the amount of scholarship received, and what type of student you are. Because this credit is based on the first four years of post-secondary education, you can only claim this credit for four tax years. Alright, so that’s the basics. Let’s look at the details and see if you qualify. Now remember, this is only for the first four years of college, so graduate school, med school, law school, and any other school after your bachelor’s doesn’t count. If this is you, just go ahead and skip down to the Lifetime Learning section to see what credit you can get. Otherwise, if they’re footing the bill, it’s probably fair to let them have this one. After all, they are paying for school and everything. But if you’re a student in your first four years of college and no one claims you as a dependent, you can probably get this tax credit. So be sure to check it out when you’re doing your taxes. Let’s keep digging a bit deeper though and find out what it means to have “qualified expenses” and be an “eligible student”. For the American Opportunity tax credit, qualified education expenses are tuition and specific related expenses that are required for enrollment at your college. These related expenses must be required by your institution. Meaning that you would not be allowed to attend school there if you didn’t pay them. This would include things like student activity fees, library fees, green fees, and athletic fees. Expenses for books and other courses materials can qualify if it is required by your institution. This is a gray area and can get a little fuzzy sometimes. So when in doubt play it safe and don’t include it. Things like room and board, insurance, transportation, and other living expenses don’t qualify and can’t be counted towards qualified education expenses. You should also know that money spent for a semester beginning in the next tax year can still qualify for the previous year. Here’s an example. If you paid tuition in December of 2015 for the Spring 2016 semester that starts in January, that tuition counts for as a qualified expense for the 2015 tax year. Even if you meet all three of the requirements above for paying qualified expenses, the student must still meet their own requirements before you can claim the credit. The student must not have already completed four years of post-secondary education. This would typically be freshman through – senior years of college. This doesn’t include any courses taken in high school, though. The student must not have already claimed the American Opportunity tax credit 4 times in the past. The student must have completed one academic semester during the tax year in an academic program that leads to a degree or certificate. The student must also have maintained at least half-time status throughout the academic semester. At the end of the tax year, the student must not have a federal or state drug conviction. Like all of the tax codes in America, these tax credits are super confusing. Unfortunately, even if you meet the three main requirements, have qualified expenses, and meet the student eligibility requirements, you still have a few more restrictions. For instance, you can’t claim the credit if you are single and make over $90,000. And no one can claim the credit if you are married filing jointly and make over $180,000. You also can’t claim the credit if you are married but filing separately. And like I said earlier, you can’t claim the credit if someone else claims you as a dependent (like your parents). Then that person would get to claim the credit. Alright, so if you meet ALL of the above requirements, you’re good to go. Now let’s figure out how much you get. First you need to find out your total qualified education expenses. Typically the school will send you a form 1098-T in January or February. On this form, it will list all of your qualified educational expenses. This form will also list your qualified scholarships, fellowships, and grants. These funds will reduce the amount of qualified education expenses. For example, let’s say you have $10,000 in qualified expenses for tuition, school fees, and books. And you also have scholarships worth $4,000. This means that your total qualified tuition is $10,000 – $4,000 = $6,000. Now you can calculate your tax credit. The American Opportunity tax credit is worth 100% of the first $2,000 of qualified expenses and 25% of the next $2,000. $6,000 of qualified educational expenses. So the credit is 100% times the first $2,000 = $2,000. That leaves $6,000 – $2,000 = $4,000 left over of qualified eduactional expenses. So then the credit is 25% times the next $2,000 = $500. That leaves $4,000 – $2,000 = $2,000 left over in qualified expenses. So you would get to claim the entire credit worth $2,500. Again, this is a credit. So that means you get to take it directly off your taxes! If you only had $3,000 of qualified educational expenses after scholarships were accounted for you would only be able to get a credit worth $2,250. Here is the calculation. You can claim the credit by filling out the form 8863 for the IRS when doing your taxes. You would fill out this form and attach it to your form 1040 on your personal tax return. If you use an online software such as TurboTax or TaxAct just be sure to answer the questions about education and it will fill out this form for you and take you through the required steps. If you have an accountant do your taxes for you just be sure to give them your form 1098-T from your school and mention this credit to them. They should be able to calculate the credit for you. Just always make sure to remind them of it and let them know all about your school expenses. Lastly, if you still have questions about this credit the IRS has some good information that can be found here. The Lifetime Learning tax credit is similar to the American Opportunity credit in that it directly reduces the amount you pay in taxes. It even has a few similar restrictions like qualified expenses. However, there are a few major differences with this credit when it comes to who is eligible and how much you can receive. The full amount of this credit is $2,000 and like the American Opportunity credit, it is based on a variety of factors that we’ll discuss below. The Lifetime Learning credit has the same initial requirements as the American Opportunity Credit. The biggest difference is how the credit is calculated and how many years you can claim the credit. The Lifetime Learning credit has no maximum cap on years. This means that as long as your paying school expenses, you can keep claiming this credit. This is helpful for graduate, med, and law students. The qualified expenses are mostly the same as the American Opportunity tax credit. They include tuition and fees that are required by the institution. However, books and other course material only qualifies if is must be purchased as a requirement to enroll. You cannot count the books and course material if you could enroll in the class without purchasing them. The student eligibility is much more lax for the Lifetime Learning credit than for the American Opportunity credit. There are no limits for how many times this credit has been claimed in the past. You can claim this credit an unlimited number of times assuming you meet all of the other requirements. The student also doesn’t have to be pursuing a specific program or degree to receive this credit. They just have to take classes from an institution that qualifies. The Lifetime Learning credit also doesn’t have a restriction based on how many classes you take. You don’t have to be half-time to claim the credit. You can just take one class and still qualify. There are no drug conviction restrictions for this credit and those convictions don’t make the student ineligible. This is why the Lifetime Learning credit is great for students who have already completed a bachelor’s degree. It has very few restrictions as long as you are attending school and paying qualified expenses. Like the American Opportunity tax credit, the Lifetime Learning credit does have an income limit. If you are married filing jointly the limit is $130,000 and if you are single it is $65,000 for 2015. Also like the American Opportunity credit, you cannot claim the Lifetime Learning credit if you are married filing separately or can be claimed as a dependent on someone else’s tax return. If someone else claims you (such as your parent) then they will get to claim this credit instead. The Lifetime Learning credit is calculated the same way as the American Opportunity credit, it just has a different formula. The Lifetime Learning credit is worth 20% of the first $10,000 paid for qualified education expenses. Let’s say you paid $15,000 in qualified expenses and received $4,000 worth of scholarship. That means your total qualified expenses were $15,000 – $4,000 = $11,000. So your credit would be 20% times $10,000 = $2,000 (which is the maximum credit available). Again, you can claim the credit by filling out the form 8863 for the IRS when doing your taxes. You will use the form 1098-T that your school sends to you and either enter the information yourself into an online tax software or give it to your accountant. If you still have questions on the Lifetime Learning credit, the IRS has some good information that can be found here. Both of these credits are extremely beneficial, but it’s important to know that you can only take one of these credits per student. So I want to highlight a few key differences. If you qualify for the American Opportunity credit, always take it. 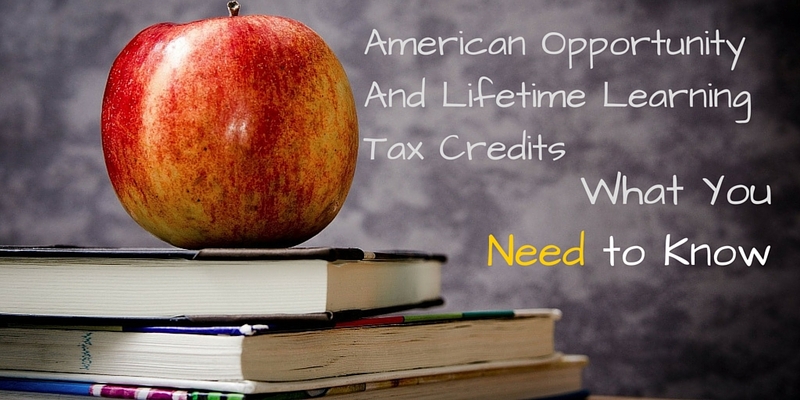 You will get more money in tax credits from the American Opportunity than you will the Lifetime Learning. The Lifetime Learning credit is easier to get than the American Opportunity credit, but it is also harder to get as much money. Let’s look at the example I used earlier for the American Opportunity tax credit. Let’s say you had $3,000 worth of qualified expenses after scholarships were accounted for. So you always want to take the American Opportunity credit if you qualify. But if you are a graduate student or going to school less than half-time you won’t be able to, so just go with the Lifetime Learning. Overall the major difference between them comes down to when you can take it. If you are going the typical route and plan to graduate in 4 years with your bachelor’s, more than likely you will just take the American Opportunity credit every year. Then if you do more school after that you can take the Lifetime Learning credit for as long as you keep going. Hope this breakdown has helped you and saved you some money this year on your taxes! If you still have questions, be sure to leave a comment below and I’ll help out. And if you know someone else who was in college last year, be sure to share this article with them using the social media buttons below!